Well, it is Thanksgiving Eve and I just want to wish everyone a Happy Thanksgiving! What a wonderful time to share and enjoy family. Lots of preparations for me today. I will me making apple pie, homemade rolls, cranberry sauce, cleaning the turkey and preparing the stuffing. One year I bought Costco rolls and my family was so mad at me. I just didn't know that it was a tradition! We like pumpkin pie but they also prefer my apple pie over any pie. So that is a must too! My daughter in law has a tradition of eating Chocolate Mousse Pie on Thanksgiving so she will bring the Chocolate Mousse. Hope you have a delicious celebrations with your family!. 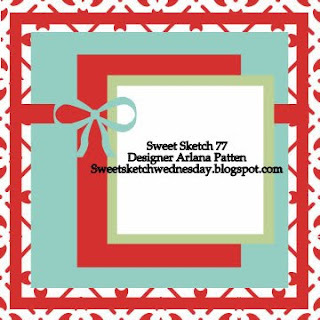 This is the fabulous sketch that my sister, Arlana, has for you this week at SSW! I love the clean lines of this sketch and how it draws your eye to the focal point of your image! I do hope you will take a few moments and look at what our DT has created for you this week at SSW! A Kids View Under the Tree. The one thing I want to share about my card is the embossing folder that I borrowed from Arlana. It is called Cuttlebug Sledding. I just love the look it gave. If you will notice...the embossing is reversed. Instead of being raised it is indented! I just love the texture it gives. I have looked at every craft store I have visited in the last two months...with no luck in finding it. I will have to check the internet when I find a spare moment. For my Christmas bulbs I used the Metal Dots...also one of my favorite embellishments! The picture doesn't show it very well, but I also used puffy for his Santa Hat. Of course, the little star and button are from Arlana's Crafty Stash! Happy Thanksgiving Week and I hope you enjoy what we have to share with you today! Whatta cutie! I just love the reversed Cuttlebug folder! Yummers - I wish I could come to your house for Thanksgiving. I love pie! Happy Thanksgiving. Judi, I wondered if that was an embossing folder. I love it! I will be on the look out for it down here. Doesn't Arlana have lots of fun little treasures..and your card is adorable. You made me smile when you talked about the rolls. Scott was making sure I was making all the traditional things too. I have a busy day ahead of me.. Have a wonderful Thanksgiving with your family. I'm coming to your house tomorrow for sure Judi!!! And I'll bring my embossing folder with me...email me your address and I'll mail it to you. It's not my fave so I don't use it. Your card is adorable. Is he putting that present under the tree or snitching it out from under for himself?! Anyway, it's super sweet. Have a wonderful Thanksgiving! Super cute card Judi, I too love the embossing with this folder, it caught my eye right away..Love all the little added details on the card, but especially love the beautiful plaid ribbon and bow!! Wishing you a very Happy Thanksgiving! Absolutely adorable Judi! I love the embossing especially with it inverted - it is a perfect detail on this card, of course along with that present paper! Cutest image too! Have a wonderful Thanksgiving! Hi Judi, your card is awesome, I love the image but I adore your colours and design papers great job. I too love that embossing folder I don't have that one I have another Xmas folder. Have a wonderful thanks giving my family will be there with bells on for pie they love food. When you have a moment please send me your recipe for Pumpkin Pie they are grown locally here in Pukekohe. We eat it here as a vegetable roasted, mashed and boiled with a little butter, salt and pepper. Happy thanksgiving we don't celebrate it in NZ an American tradition. 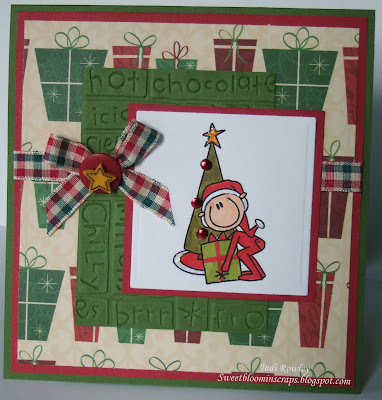 This is super cute, love the embossing and the coloring is perfectly matched to the colors of the papers. Hee hee So so cute. That textured panel is awesome. Very cute and festive. Judi, Your card is SO CUTE!! I love that image! But of course, what's not to love from Bugaboo?! I also LOVE that textured paper. Very cool! too cute card, fab digi! Judi - I like EVERYTHING about this card!! Super, super cute! Hi Judi! MMM now I am hungry!!! Your card is just adorable!!! Cute image and paper, the embellisments are perfect! I love that ribbon! Judi. It was so fun watching you create this sweet card. I love your image . I am so gald you came and find thing to uses form my statch. I treasure the times we get to spend together. Love ya and miss ya. Thanks for all you do. Lovely card Judi, I love that embossing and the image is sooo cute. Sounds like you had a scrummy thanks giving. Hope you're keeping well. I love how you did the ornaments and the bow. Such a sweet card! So cute...sweet image and gorgeous papers. Such a sweet card and I LOVE the embossing folder. I'll have to add it to my wish list. TFS! Cute! I love the ribbon/button embellishment. 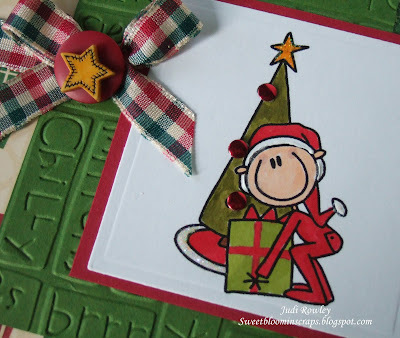 cute card and cute image - love the little bum in the air ! heheee ! yummy..yummy...yummy card! love the darlin image..and that plaid ribbon...so scrumptious! thanks so much for the inspiration!